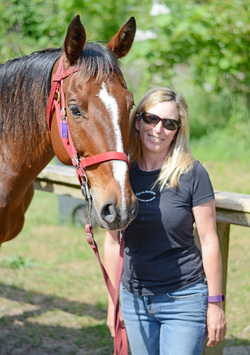 Equine Adventures was established in 2001 by owner and operator, Sylvia Mattingly. Sylvia has over 25 years of experience with horses and prides herself on being very involved in daily activities and overseeing all of the horses care. The barn is situated on 8 acres of land, tucked away down a gravel road in a private community and is approximately 2 miles from the beach. The staff is enthusiastic and dedicated to the care of the horses and the satisfaction of the guests. Sylvia learned to ride at the young age of 3 in Puerto Rico where her father was stationed at Roosevelt Roads. Both of her sisters were barrel racers. When they moved to the states she then took English riding lessons at a big lesson barn. She kept her first horse on a dairy farm where she would ride all day long, fishing in the ponds, and playing in the hay barn and was generally a free spirited tom boy. When she outgrew her first horse she took up English riding lessons again and participated in some shows on the local circuit. In 1993 Sylvia bought the property that Equine Adventures now sits on with the thoughts that she could have a small farm on the 8 acres. She soon bought a horse and her 3 year old daughter was given a pony that she could ride up and down their quiet road. After getting out of the restaurant business she decided to open Equine Adventures. They had a beautiful trail to the beach from the property and she needed a new occupation to take care of her two small children; the perfect scenario. Having the barn at her house allowed her to kind of be a "stay-at-home, but busy all the time Mom!"